Your reporter squealed like a little girl when she realized she had actually found a potato. It starts with a Lutheran Church on fire. St. Paulus at Eddy and Gough burned to the ground in 1995 and has remained a vacant lot ever since. Then, this year, an improbable alliance came together. Case Garver, a 22-year-old Lutheran Volunteer Corps member from Ohio, and Megan Rohrer, a local pastor, were negotiating with local churches to open up unused property in the city for farming. It was more than just a quaint idea — Rohrer is director of Welcome, an organization that deals directly with the poor, and food banks in San Francisco continue to be stretched to their limit. Rohrer secured permission for the St. Paulus lot. Then came the tricky part. Tree agreed to help run the farm with Anderson and some other nonprofit groups, with the idea that some of the produce would go to the Free Farm Stand in the Mission. The Lutheran synod that owns the church site agreed to cover the water and electrical bills. And so the farming began. “We did have gloves,” he adds. Planting in the basement of a burned-out building turned out to have its advantages — the plants were sheltered from San Francisco’s gale-force winds by the remaining walls. The terrible soil is producing more food than anyone expected.The first harvest at the plot they named The Free Farm — 5.5 pounds of produce — came out of the garden on April 11, just a little over three months after work began. A second mini-stand was established outside and began passing out food to residents of the immediate neighborhood. By the end of June, the free farmers had harvested 784 pounds of produce in six months, the most of any garden in the network supplying the Free Farm Stand. On a Wednesday afternoon, a volunteer sits outside the farm behind two galvanized tubs of gargantuan, prehistoric-looking collard greens, offering them to slightly confused passersby. The quirks of the landscape are still being discovered — carrots have been challenging, collards and cabbage have done astonishingly well. There is fortune in this: Collards have been one of the most popular crops in both neighborhoods. Attempts to push kale have been met by resistance. 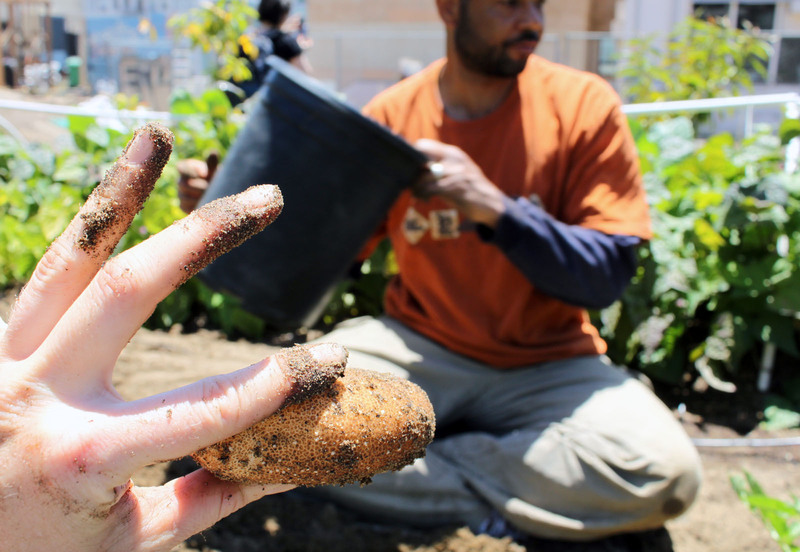 Inside, volunteers are elbow-deep in the dirt, feeling around for the first crop of potatoes. They range from a very enthusiastic visitor from southern Japan to Steve Pulliam, a recent transplant from Atlanta who found the place while walking his dog. When he began, he had no gardening experience. Five months later he is speaking confidently about duck droppings.